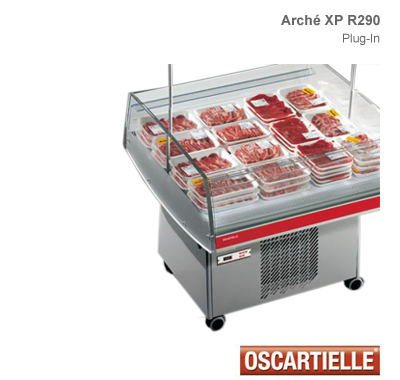 The Archè range of refrigerated islands by Oscartielle offer a large display area and all-round visibility - ideal for promotion of packaged food products such as meats, vegetables, deli meats and dairy products. The refrigerated island has an incorporated compressor unit. The high versatility of use and ease of positioning make it ideal for use in any size store. 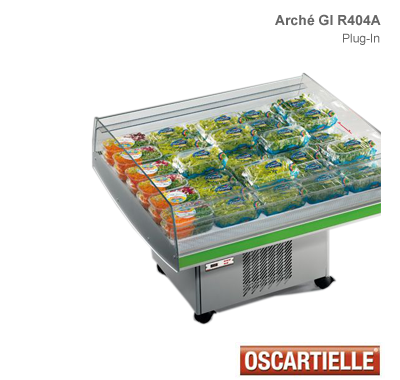 These features are enhanced by the possibility to tilt the basin from 0° to 10° and by the availability of a version with curved top glass for assisted sales. Ease of cleaning is another important feature that facilitates the operator. The standard equipment includes electronic control and digital temperature display.